ALLEGIANT reported drill results for 13 holes. Allegiant Gold Ltd. (AUAU:TSX.V; AUXXF:OTCQX) announced the drill results from the remaining 13 holes, holes 156-168, from the 22-hole phase 1 resource expansion drill program, totaling 8,265 meters, at its 100%-owned Eastside gold project, located 32 kilometers west of Tonopah, Nevada. "The phase 1 resource expansion drill program was successful in extending the Original Zone, an area within Eastside, 300 metres to the west and 400 metres to the south, where it still remains open in both directions," noted the company. "Further, all of the holes were drilled in areas currently classified as waste in the pit-constrained resource estimate, which currently stands at 721,000 gold equivalent ounces1, below the planned pit or below the pit layback. Drill hole 147 returned 42.7 metres of 2.49 g/t gold, including 9.1 metres of 9.03 g/t gold. Drill hole 151 returned thick zones of gold and silver mineralization bottoming in 79.2 metres of 1.03 g/t gold. Drill hole 161 returned 74.7 metres of 0.89 g/t gold." "We're very pleased with the results of the phase 1 resource expansion drill program," said Robert Giustra, chairman and CEO of Allegiant. "The results demonstrate that our objectives of doubling the in-pit ounces and significantly reducing the strip ratio at the Original Zone remain in sight. Further, the results verify that the Original Zone is a very large gold system. Drilling to date has not constrained the boundaries of the deposit and it remains open in almost every direction." "The Original Zone remains open to the west, south, and to depth, and possibly to the east and north. It is important to note that due to difficult drilling conditions, seven of the 13 drill holes had to be abandoned, several of which terminated in gold mineralization," the company noted. Allegiant said it plans to begin a phase 2 resource expansion drill program at the Original Zone after completing the high-impact discovery drill program to see six projects drilled over the next 10–12 months. The high-impact discovery drill program is currently underway with Red Hills the first project to be drilled. However, included in the six-project drill program is Adularia Hill, a new prospecting discovery at Eastside. 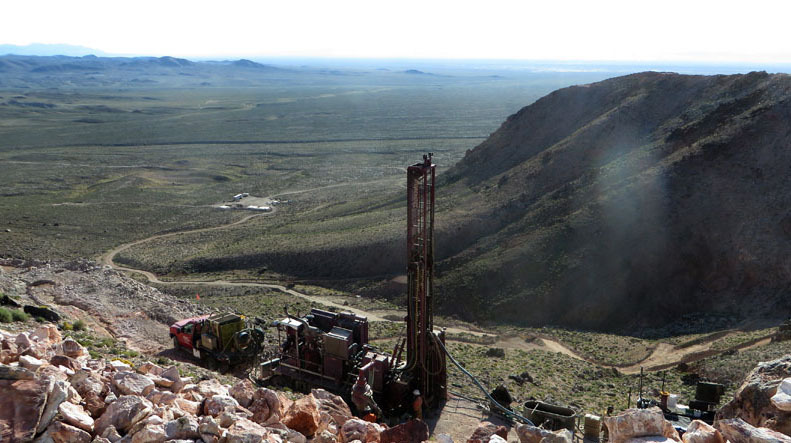 Adularia is a drill site located approximately 12 kilometers south of the Original Zone deposit and just north of the Castle, Berg and Black Rock Zone, which host historical resources of 272,153 ounces gold. "Adularia represents just one of the many high-quality exploration targets that exist at the district-scale Eastside," stated the company.